the area of and around Los Angeles did look a bit different than today and slightly different animals wandered around, eating each other on occasion. Like these two guys. 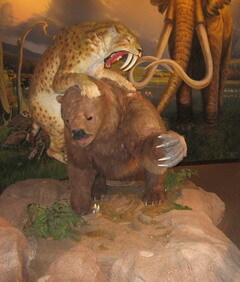 A wonderful place for those interested in extinct Ice Age plants and animals is the Page Museum at the La Brea Tar Pits. These pits are a cornucopia of fossils for paleontologists and a fascinating place to visit for both adults and children. Nobody will be bored, because the whole place manages to give adults an interesting insight and overview of this period without leaving the kids bored to tears. Far from it. For kids this place is Heaven. Once there, one should not forget to visit one of the actual excavation sites and to spend some time in the atrium rainforest garden, which is a little hidden gem.